The thyroid gland is located at the bottom-most part of the neck and is a very important part because of its metabolism regulation. This gland is responsible for the production of two important hormones and a lot of people suffer from either hyperthyroidism or hypothyroidism. These diseases affect the overall structure of the body and alter a high amount of parts. The same diseases also affect the eyes, especially in case of hyperthyroidism. Females get Thyroid Related Eye Problems more than men and this usually happens at the age of 45 and more. In cases like Grave’s disease, there is a higher than needed or less production of thyroid hormone. This happens because a certain kind of antibody comes and sabotages the functioning of the thyroid gland. The same thing affects the eyes and gives rise to different kinds of eye problems. Not many people know this, but the thyroid eye disease happens regardless of the functionality of the thyroid gland. Even if the person’s thyroid gland is working fine, it may still happen. There are a lot of symptoms associated with this disease. First of all, there is highly swollen tissue in the vicinity of the eye. 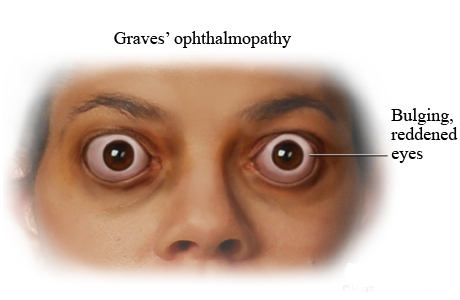 Other symptoms include photophobia, which is repulsion to light, redness in the eye and constant production of tears. The eyelids may also swell up in some cases and this is a very typical symptom of this disease. The eye can protrude out because of the no space found in the orbital area. If there is no space for the expansion of eye muscles and other related content in the eye socket, the eyes always have a high chance of protruding out. Loss of vision can occur and it becomes very difficult to move the eyeball around. The first step is to restore the thyroid gland to the euthyroid state and then, deal with the thyroid problems. The thyroid specialist analyzes how severe the condition is because in some cases, the presence eye diseases extends even after thyroid gland being normal. The treatment is extremely prolonged and may take several years. The active eye disease is treated over a period of three years with ointments and medication given. This is applied every night to the eyes and finally, the active eye disease is removed. This treatment is done by an ophthalmologist. The remission phase comes after this in which any parts that are still existing after dealing with the active eye disease still exists. These are the thyroid problems associated with the eye, the symptoms, causes and ways of diagnosis and treatment. Is there a solution for very high myopia?